The Horse Chestnut is found naturally in parts of Albania and Greece. In the UK, horse chestnuts have been planted as ornamental trees, particularly in suburban roads for their spectacular candles of white or pink flowers. The Horse Chestnut is also well known amongst school children and the 'young at heart' for part of its fruit: the conker. Each year the Northamptonshire village of Ashton hosts the World Conker Championships in October. The winner of this competition is lead to a conker throne and presented with a crown of conkers! 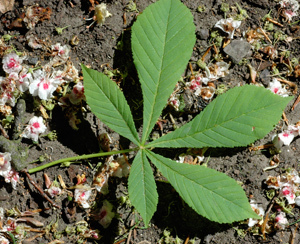 Sadly the horse chestnut has been subject to attack by a fungus called Guignardia aesculi or the leaf blotch fungus. Reddish brown patches appear on the leaves (from July onwards), particularly at the tips and edges of the leaflets. A closer look will reveal small black pimples, the fruiting bodies of the fungus. Infection may result in some of the leaves falling early, but it does not usually result in significant damage to the tree. However, infection of the horse chestnut with the larvae / caterpillars of a small moth (Cameraria ohridella) has a much greater impact. 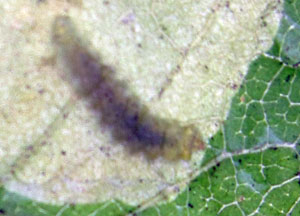 These caterpillars feed on the tissue between the upper and lower surfaces of the leaf, producing ‘mines’. These are tunnels through the leaf where the tissue has been eaten. The insect can pass through several generations each summer. Horse chestnuts can suffer very severe infestations with these caterpillars and the leaves fall prematurely; the tree is basically defoliated. 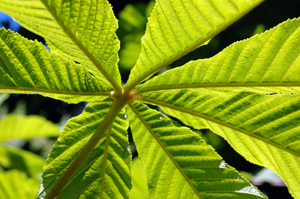 The leaf is a compound, palmate leaf that has 5 - 7 leaflets. The leaf stalk or petiole is long and slightly swollen where it meets with the stem. The leaflets are narrow at the base and broaden out towards the tip of the leaf. Each leaflet has a prominent central vein / mid-rib. The margin of the leaf is serrated. The bark may be described as having large, smooth flakes, and may be a greyish-green colour: some have used it as the basis of a yellow dye. The wood is of little use for timber. The buds are arranged along the twigs in pairs and each pair is set at 90° to the previous pair. The twigs often have many leaf scars, which are often described as horse shoe shaped - even down to the ‘nail holes’ (which is where the fibrous xylem tissue entered the leaf). The buds are protected by scale leaves which have a deep red-brown colour and are sticky. 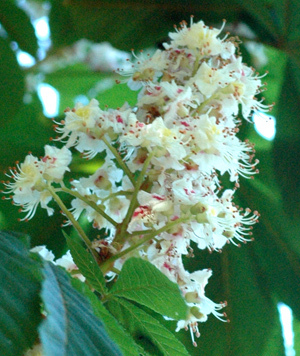 The flowers of horse chestnut are possibly the most obvious of tree flowers. The tree produces many spikes of white to pale pink flowers (often called candles). The flowers will eventually give rise to the spiked fruits, which contain conkers. 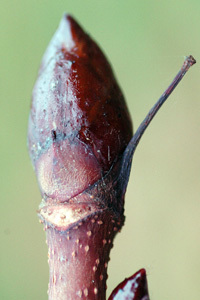 The winter twigs are recognisable by their large, brown-red, sticky buds. The scale leaves are particularly obvious, as are the scars formed where the leaves from previous seasons have fallen off.